Put everything in bread mixer with first few cups of flour. Turn timer on for 10 minutes, and while your mixer is running at lowest setting, add more flour, a cup at a time. Try to add flour fairly quickly in the beginning and then once you get to around 9 cups, sprinkle just a bit more flour until most of dough is no longer sticking to sides of bowl. Stop mixer and scrape sides of bowl at least twice during this process. (But don’t stop the timer.) Once you’ve added the right amount of flour, you should still have a few minutes left to knead until timer goes off. When done, place dough in a large, lightly greased bowl (or 2 smaller ones) and lightly cover. Set aside to rise for 5-1/2 hours. When done, punch down and place on lightly greased counter. Shape into 5 loaves and place in well-greased pans. Poke with fork to remove air pockets. Allow to rise for at least 1-1/2 to 2 hours or until ready to bake. They should pass the “finger poke test”. After 1 hour, begin checking every 15 minutes for readiness. Gently poke dough and if it leaves an indentation, it needs more rising time. (You may want to check it right after you put it into pans, to better observe the changes when it becomes more active.) When the hole fills in after you poke it, it’s ready to be baked. If you happen not to catch it in time and the area deflates a bit after you poke it, it rose too long. This is what causes your loaves to deflate in the oven. Bake at 350 degrees for 20 to 30 minutes or until done. After removing pans from oven, spread butter or oil on top of crusts to keep them soft. Remove bread from pans and cover with pastry cloth until cooled. Place in bags as soon as possible. *Weight Loss Notes: Honey is optional and is used to activate the starter in this recipe. Since it will be fermented for seven hours, some of the sugars and starches are eaten up by the bacteria culture. It is then converted to lactic acid, carbon dioxide, and more bacteria. However, if you’re concerned it will affect your weight, you can eliminate the honey. 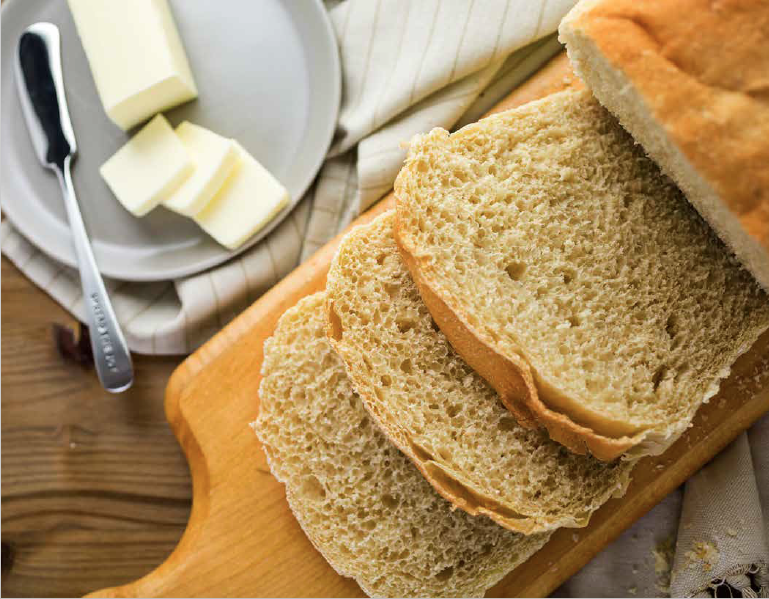 Two pieces of this bread is considered a carb serving and one piece is allowed in a fats meal, but limit other carbs. Sprouted and fermented grains are easier to digest because the phytic acids and gluten is broken down during this process. Sprouted and fermented grains will not prevent weight loss, and many people who are sensitive to gluten can enjoy grains in this way, however, these flours are not completely gluten free. †Prep Note: The baking soda is optional, but it helps with the sour taste. My mixer has a stainless steel bowl. Can I use that to mix this or will the metal cause it to fail. Thanks for your help. Hi Michelle. I’ve never done it, but other women have said it worked ok for them. However, I would take it out of the bowl as soon as you’re done mixing it. I hope it turns out great for you. What tips can you give me for succeeding on making a sourdough starter? Hi Martha! Here’s a link where to where I explain how to make sour dough starter: http://www.themullettfamily.com/recipes/sour-dough-starter/ Hope this helps!